So, you've had enough of looking at the 20-sen figures written in bold letters on every tabloid the past two days? Not surprising. This is the single biggest jump in petrol price hike in as many years. 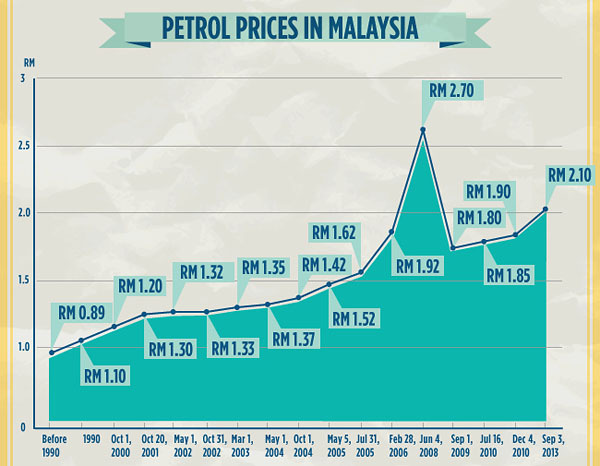 Malaysia's petrol prices have been trending up steadily for the last 20 years or so, except for a bit of hiccup (if you can call it that) in June 2008, whereby the government adjusted the petrol prices to RM2.62 (RON92) and RM2.70 (RON97), and started paying out subsidy of RM625 through Postal Order to the owners of smaller displacement cars. 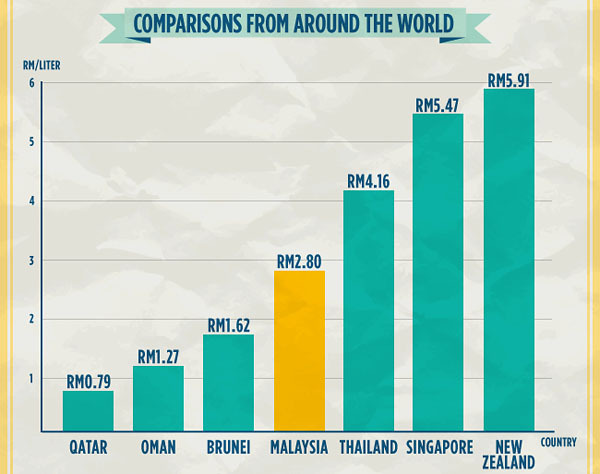 Compare our petrol price (Figure 2) with the rest of the world and suddenly you feel 'very lucky' to be paying so little for your petrol considering consumers in neighbouring Singapore, Thailand and Philippines are paying more than double that amount. You can compare more here: Petrol prices around the world. No matter how you justify it, people are bound to think you are collecting 20 sen from their pocket rather than buying your story of 'government is reducing the subsidy by 20 sen', and calling it Subsidy Rationalisation Exercise. To me it's obvious: In order to fulfill the promised higher BR1M, you have to dig it from somewhere - if not from the existing budgeted expenses, it has to come from someone else's pocket. What can the 20 sen do? For a medium-sized sedan, say a Proton Saga 1.5 litre, with petrol consumption of 50 litres/week, you are paying extra RM10 (0.20 x 50 litre) from your pocket every other week. You drive more, you pay more. In a year, you pay RM520 (52 weeks x RM10) which is slightly more than the current BR1M amount. So, you are basically paying the BR1M yourself. Worst still, if you are earning RM3,001 a month, you are actually helping the government to pay of your colleague who is earning RM2,999. Of course, I am edging towards the ledge in my shallow interpretation. But simple man like myself and the many others around me think somewhat the same thing. So, yeah, your simple explanation in the mainstream media that the 20 sen will go towards taking care of the welfare of the people, and in particular BR1M, does not add up; at least not to me. Give me something harder to munch and I will think harder. Another way is to reduce the price for those cars running with efficient engine, like hybrid & EV. Of course, government will get less income from AP. In the grand scheme of things, gradual removal of subsidy is not bad. And I'm not against such policy. But the way they put this issue into perspective ( and the way it was later explained/justified) makes it appear unfair to many people in the middle-income group.